Caption slip reads: "Photographer: Swaim. Date: 1958-05-23. Assignment: School bus fire drill. 23/24: Bus load of 70 school children driven by Mrs. Margaret Redington being emptied in orderly fashion during Arcadia fire drill. Drum of gasoline burning near rear of bus. 18/18/27/28: Same drill, in which Frank Urzt is driver. 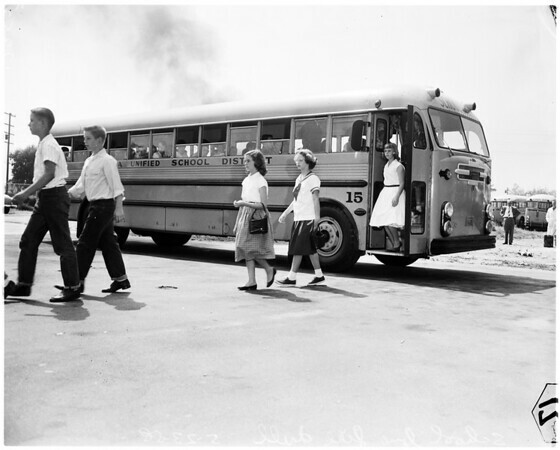 19: Mrs. Margaret Redington, only woman school bus driver in Arcadia, extinguishing flames in drum as part of drill. 20: Driver Frank Urzt ushering children from inside of bus during drill. All are 6th grade pupils at Santa Anita school, Arcadia".